As a kid, I read a lot. Anything from fantasy to westerns to science fiction. I started making up my own stories and wrote my first short story at 12. I also started drawing comics–little stick figures with dialogue balloons that later evolved into musclebound warriors and scantily clad vixens. I gave them battle axes and broadswords and unleashed various renditions of the Kraken on them. A silent chaos ensued, followed by crickets chirping and nothing much else. Alas, life kept interfering and I allowed it, and nothing came from my artistic endeavors. After graduating high school, I served a year in the military where I learned to dig trenches, eat quickly, and miss girls. I traveled to Israel and lived on a Kibbutz for almost a year, working in avocado fields and drinking cheap vodka. I sold pots and pans and educational toys in Africa for a while and almost got shot by Mugabe’s guards in Zimbabwe one night. I did a brief stint as cartoonist somewhere and an even briefer stint as reporter somewhere else. Of course, the next ‘logical’ step was to start a business producing stained glass terrariums and weird-looking vases, which I did for about a year. Somehow, and maybe by accident, I ended up in law school and became a lawyer. I did that for almost a decade. These days I find myself in New Zealand with a wife and three kids and a dog named Stella, but I’m back to writing stories. 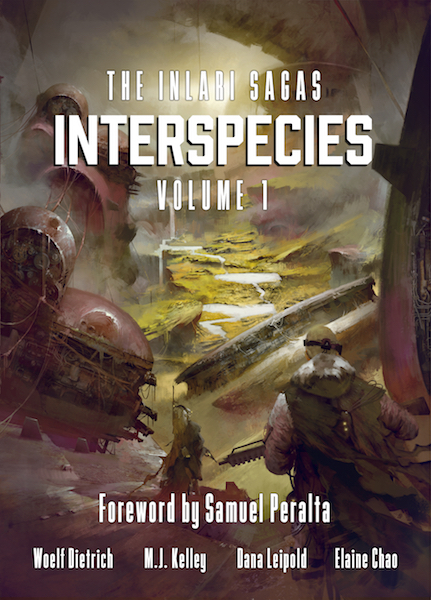 I’ve since been nominated three times for New Zealand’s Sir Julius Vogel Award for speculative fiction and shortlisted during 2017 for my story “Babylon’s Song” featured in the anthology, Interspecies. I mostly write tales of dark fantasy and the supernatural and a bit of science fiction, which is maybe not such a far cry from my lawyering days. Sometimes I write other things. I co-founded a small publishing label called Kōsa Press. It’s really awesome. I’m also a member of the writer’s group, The Collective SF. Welcome to my online home. Stay as long as you want. Thanks, I appreciate it. This certainly seems to be an adventure that requires some along with a truckload of persistence. WOW!!!! Cannot wait! This will be a MUST read for me! Thank you. It’s kind of you to say so. Thank you for the kind words. I hope my stories reflect the eclectic nature of my personality and background. Did you see any other parts while you were here? Where do you live now? Oh, I now live in London, UK. Yes, I was in Kati-kati for a little, then I spent some time in Auckland. It’s good to travel and work in different places. Thanks for commenting. Good day, sir. I interviewed JazzFeathers on my “Beyond the Rails” blog, and followed your comment back to find a most entertaining fellow who happens to write books. You’ve done a wonderful job with your site, and you may now number me among your followers. I’m looking forward to an enlightening ride! Thank you for the kind words. I enjoyed that interview. Welcome onboard. I hope you enjoy the ride. After reading your bio, I may need to rewrite mine. Glad I found your website. Enjoying the posts.